Nicole admits that she has a serious soft spot for Cosmo Cricket Diecut Button Covers. Aside from the gorgeous patterns and colours that they are available in, what she loves the most, is how each set fits the SAME Bucknaked Chipboard buttons. 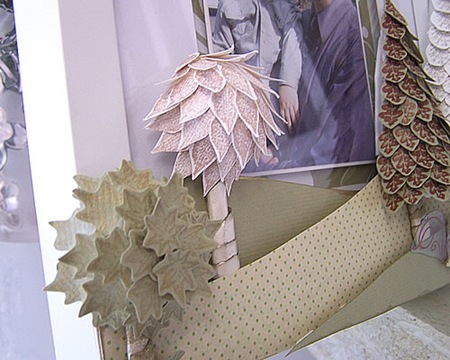 The diecut sheets are a perfect fit for the Bucknaked chipboard making them extremely versatile. Not only are chipboard buttons included but you also get frames and outlines of shapes as well in stars, hearts, circles, flowers and frames. Earlier Cosmo ranges fit these as well as ranges as new as the Hello Sunshine that Nic has used here. 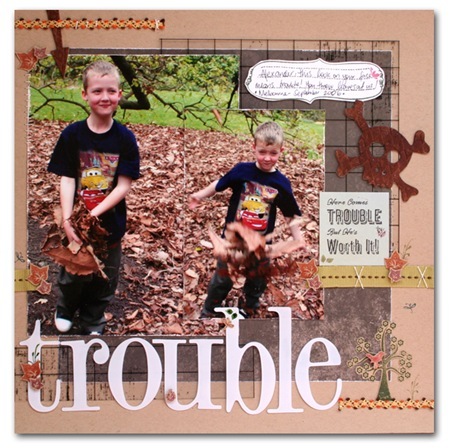 Use Cosmo Cricket die cuts on their own, on the Bucknaked chipboard or a mixture of the two as Nicole has demonstrated by layering them in a border around her photo. 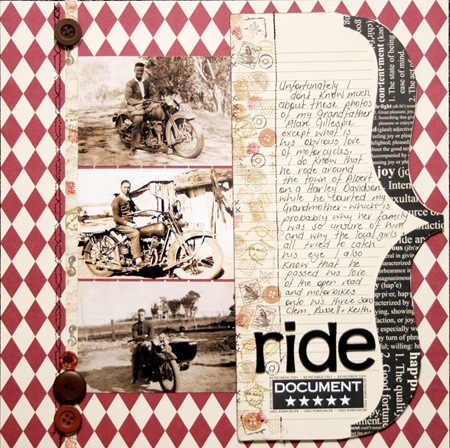 Diecuts come in all shapes and forms, but for this layout Mel has chosen to use some of the Scenic Route Providence and Ashville dies. 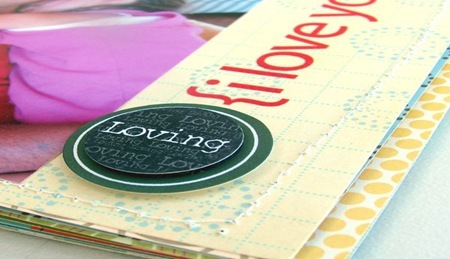 The funky green arrow draws attention to the journaling (all about Bella being the biggest talker in Mel's family), while the Ashville journaling diecut has been added for the title. 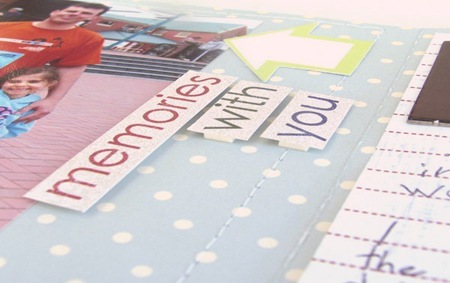 Diecuts are pure fun and suitable for a huge variation of pages, but be warned they're highly addictive too! 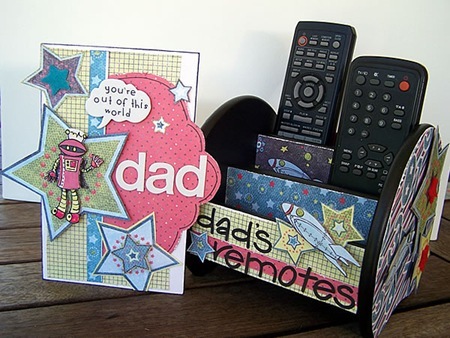 This layout was extremely fun to create, the Cogsmo Die Cuts are an absolute joy to use, the are really fun and very colourful. 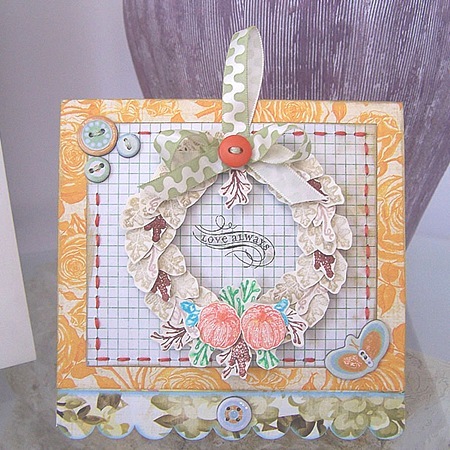 Carole in her typical vibrant style has dimension going on everywhere in this layout, using the die cuts and the pattern papers, and she has even added stitching and ribbon to bring it all together. Suz's daughter came out with this statement when she picked a daisy from the front garden with dew drops on it and though Suz knew grabbing the camera and trying to capture the 'diamonds' would probably make them late for school, she knew it had to be done. 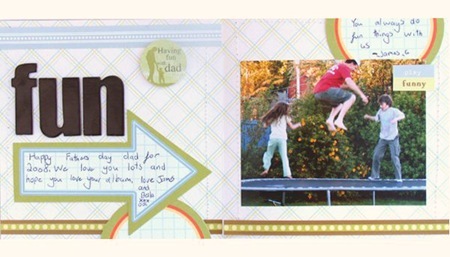 Suz's Quickutz Revolution helped to make this a beautiful layout with lots of detail, yet keep the overall look simple. Diecuts include the beautiful Flourish and Vine 12" borders, but there's also the alphabet title (Deisel) and the diamonds shapes, which she also embossed with a Quicktuz Goosebumpz Diamond embossing dies. A Hambly transparency and a smattering of Heidi Swapp diamonds and chandelier crystals completed the look and the beautiful innocence is captured forever! This entire layout is made from Quickutz Revolution die-cuts, using BasicGrey Periphery and Heidi Grace Wildflower papers. Once again Suz used the beautiful 12" borders - Flourish and she cut the Vine from a Hambly transparency to layer over the top. 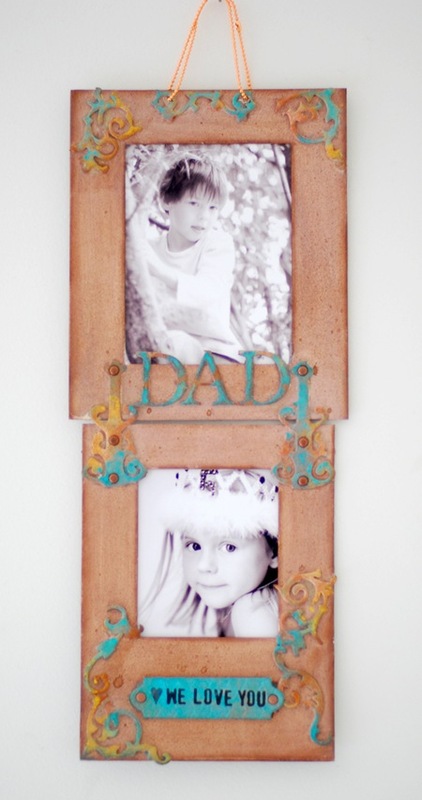 The butterfly, the frame and the embossed squares that mat the photo are all shapes cut with the beautiful Revolution - these shapes are so versatile you can use them over and over again, giving every layout a different look. If there's one thing that SEI do really, really well, it's die cut shapes and elements! 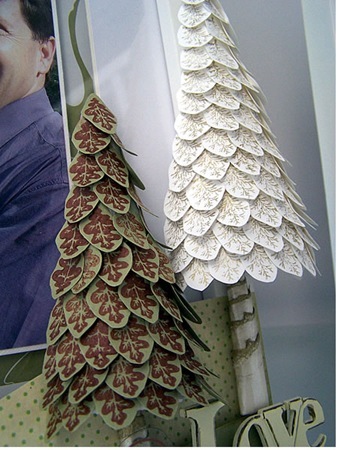 In this layout, Donna particularly wanted to demonstrate that no paper-cutting is required when you begin with a quality range of diecuts. 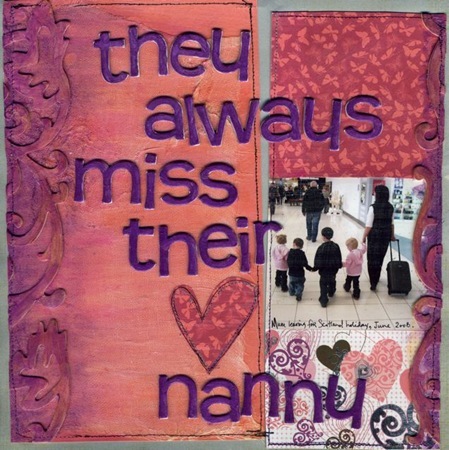 To create this simple, but effective layout, Donna has layered SEI's Poppy Die Cut Accents over the bottom corner of her photo in the same way that one would with hand cut elements. The Die Cut Dimensional flower adds greater interest and is topped off by a transparent diecut overlay by non other than Heidi Swapp. The result is a perfectly simply layout that took no time at all to put together! It's easy to see how quick a layout can be when you look closely at this layout by Nic Howard. Nic is normally the kind of scrapper that spends many hours on each layout but was surprised at how quickly this came together using the Quickutz die-cuts. 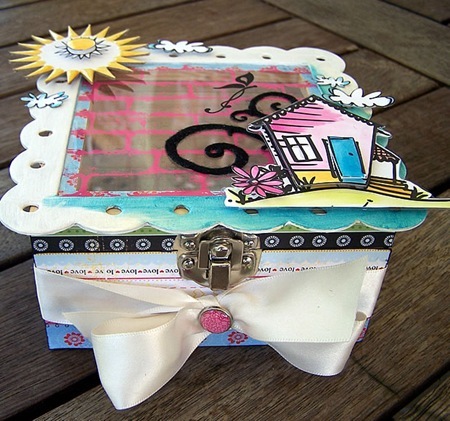 Nic started with a patterned paper by Heidi Swapp and added tag and bookplate diecuts to create a base for her journaling. 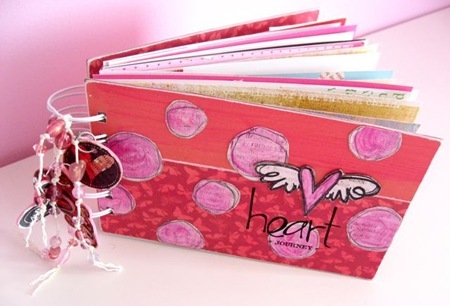 She added a title from Pink Paislee alphas, some photos and that was the layout complete! The die-cuts add detail easily. 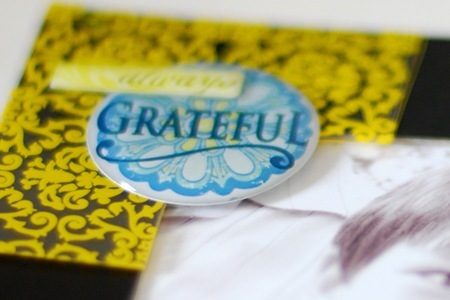 Notice the dotted border down the left side - yep, you guessed it - another Quickutz border die-cut! You can't get a simpler project than this. 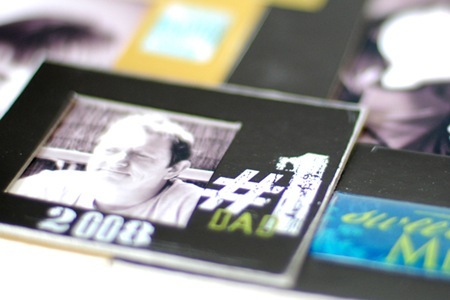 2 sheets of Teresa Collins die-cuts and a few sheets of black card and you have a ready to go mini album. Caz cut up the entire sheet of Journal It - tags and Diamonds and used the fronts of most of the journaling cards and the back diamond pattern of 2. The front and back cover are made from the slightly larger Journal It - Tags. 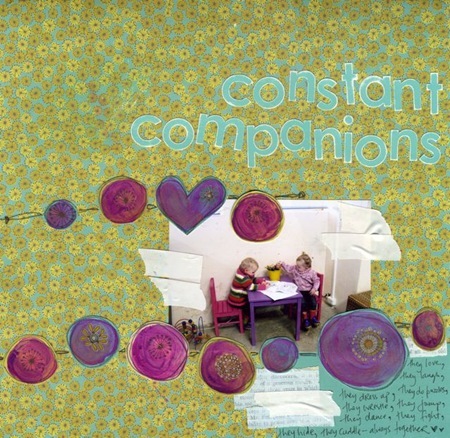 This album celebrates all the little things in life that Caz loves. A sleep in, flowers from the front-yard stall down the road, McDonalds hotcakes in bed for breaky, a sleep in, handmade cards and Mothers Day stall pressies from school. Add to this her kitties, her family, a good book (or 10) and a mug of earl grey tea and she is pretty much set for life. The last of the LuminArte products we're showcasing are the Perfect Pigments - little vials of powdered pigment that you mix with medium to create amazing and wonderful textures and can build up for amazing depth of colour. We asked the fabulous Jill Geraghty-Groves to create some layouts working with the Pigments and she blew us away with what she came back with. Jill says "I absolutely loved working with the Pigments and have used them many times since doing my layouts. They are just so incredibly versatile and I am sure that I still have not even touched on the multitude of uses they have! For this layout Jill has simply mixed the pigments with the Gel Medium. She reports it was so easy to use - the medium was much more water than she had expected so it really goes an incredibly long way. What's good about that is that you can keep adding it drop by drop if need be until you get a consistency you are happy with. Jill has also painted with the pigments directly onto the photo to highlight her subject's hair. There was absolutely no smudging of the photo which is always a worry when working directly on a photograph. Here Jill uses a strong colour mix of pigment and gel medium. 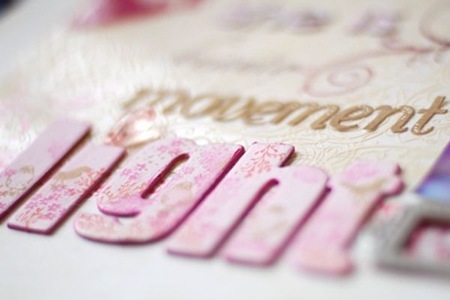 She coated the chipboard alphabet and then used a fine brush to highlight the patterns on the flourishes. 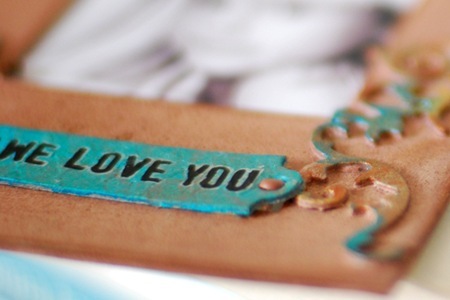 Once again, Jill has used the pigments mixed with the Gel Medium directly onto the chipboard letters. She wanted the colours to be exceptionally vibrant so I have used a fairly strong mix. As you can also see, Jill also sanded the photo and added a very light mix of pigment to highlight the sanding - once again, no smudging or bleeding on the photo which is fantastic to know. 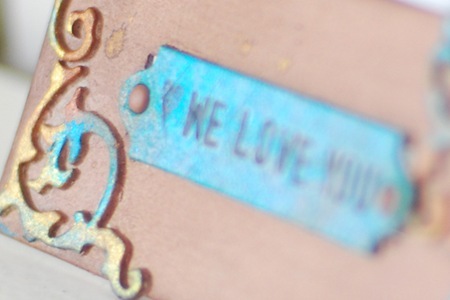 To obtain the light coverage of the chipboard flourishes, Jill half-filled a small spray bottle with water and simply added some pigment directly to it. It works beautifully and she is left with a gorgeous subtle shimmery finish. On this stunning layout a strong mix of pigment was used to obtain the vibrancy of the alphabets. Jill reports that the coverage on the raw chipboard is much easier than on finished chipboard (which requires a couple of coats) however the drying time is very quick. On the Jenni Bowlin Studios chipboard sun Jill also added some glass glitter to the gel medium and painted around the edge for a fabulous textured effect. Jill's final words: "The pigments were so incredibly easy to use and I loved their versatility - I can obtain both a colour and a texture of the paint I require and I have since added it to Mod Podge, Dimensional Magic as well as texture paste, all with glorious results. They will certainly remain as part of my "staples" in my stash!" In a word Jaimie describes Luminarte Polished Pigments as 'awesome'. Two years ago the lovely Viv Bonder gave Jaimie a crash course via email on how to use the Luminarte pigments and its a technique she loves to use over and over. Jaimie says Luminarte Polished Pigments, gel medium and fabric for added texture give that definite wow factor to backgrounds and with a few embellishments on the front you have the perfect handmade gift that is sure to be original. 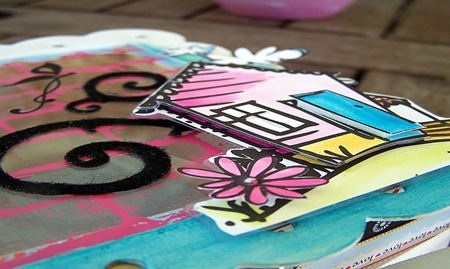 Add Luminarte pigments to gel medium and using a palette knife smear onto your canvas. Fray and rip fabric and then push into the background medium and on sprinkle mini beads - allow to dry (24 - 48 hours). Mix coordinated Luminarte pigment with Simple Solutions 2 medium and dry brush over canvas to highlight areas. Attach embellishments. Many thanks to Viv Bonder for her instructions - and stand by to see some more of her projects! This simple eyecatching canvas was created by Viv Bonder by mixing the solution and polished pigments together and applying to the canvas. Once dry Viv added her embellishments and photo then applied more of the colour around the photo. This gorgeous celtic knot bag was given a textured treatment by applying pigments and solution over textured effects then once dry another layer of solution and pigments were added over the top to give contrast and highlights. And a final piece from Viv Bonder, this funky and lumpy junque box was created by first adhering paper with acid free glue and once dry she applied a mix of solution and pigments. Simple embellishments were added once the project was dry. A huge thanks to all our guest artists contributing to this huge LuminArte post - we hope they have inspired and opened up some new shimmery possibilities for everyone! The Radiant Rain daubers are fun and easy to use. You simply shake well, lightly press down and watch the colour as it begins to flow. They really are a no mess way to paint - perfect for stamps and also great to share with your little ones (they can just roll the paint onto paper to create a picture). For this layout Mel ran the dauber (spiced pumpkin) over her background sheet of cardstock and also used the paint to cover her chipboard alphabet letters. It's hard to see in the photograph but there is a sweet little shimmer over the paint which has added a beautiful effect to her page. Nicole used the Radiant Rain daubers on this canvas celebrating her entry into motherhood over nine years ago now! She found this product amazingly versatile and easy to apply to many different surfaces including tulle, crochet lace and even a cut up knitted jumper. Different textures gave different colour effects which Nic has demonstrated fabulously. She used the rain daubers to not only colour the fabrics and background but also to stamp and to colour and age the canvas piece of her title. Nic created the textured appearance on the background of her canvas by applying the Cinnamon Brown Rain Dauber liberally over the entire blank canvas and then spraying with water. She laid the canvas flat and then sprinkled randomly with salt. Once it was dry, she brushed the salt off and was left with a gorgeous, and teeny bit shimmery variegated background. She then applied the same Cinnamon Brown rain daubers to colour the spotty sheer fabric and the pieces of crocheted cotton doily. As you can see, the brown varied from watery and water-colour like to rich and opaque. Nic used the Ginger Peach rain dauber to colour a piece of knitted jumper, some of the crocheted doily and also on the fabric flowers. She also added some Glimmermist to embroidered leaves cut from fabric, to some tulle and also to some Tattered Angels Glimmer Chips. We asked the very talented Loretta Grayson if she would play with some Luminarte products for us, and we were delighted when she agreed. So we sent her some of the Luminarte Radiant Rain Daubers and waited with bated breath to see what she would come up with! She didn't disappoint - first of all with this beautiful layout giving Pink Paislee Office Lingo papers a very different look! Loretta reports that she painted the Basic Grey chipboard letters and leaves, layering colours to create the shades she wanted. The stunning background was created by using a paintbrush to apply the colours, then finishing off with dabs of paint using the daubers. These beautiful butterflies and bird were created very simply by painting Jenni Bowlin chipboard shapes with the Radiant Rain daubers, then adding wire and beads. The Radiant Rain colours Loretta used were Sunburst, Majestic Blue, Spiced Pumpkin, Snap Dragon and Star Gazer. The colours dry quickly, so she was able to build up layers until she achieved the desired effect. Stargazer is a lighter, more translucent colour with a purplish/green opal like effect, so Loretta used blobs of it as a finishing touch, giving the mottled effect. Donna isn't a huge paint-user, but wanted to use this opportunity to demonstrate that even those that rarely dip their brush in a paint pot, can use this fabulous product to add a touch of liquid magic to their creations. 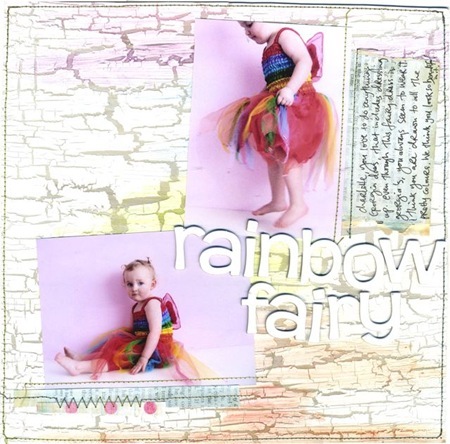 In this layout, Donna has used the soft, glimmery LuminArte H20s to add depth and dimension to Tattered Angels Glimmer Chips. If you look closely you will notice that by lessoning the amount of water used Donna has added greater depth of colour to the oval frame. To tie everything together, she has run a paint brush of the same colour around the edge of the page. While it isn't easy to capture the true beauty of these paints in a photograph, the overall effect is still soft, dreamy and feminine. Donna was taken with the shimmer of these paints and will be experimenting further with this versatile new product from LuminArte! 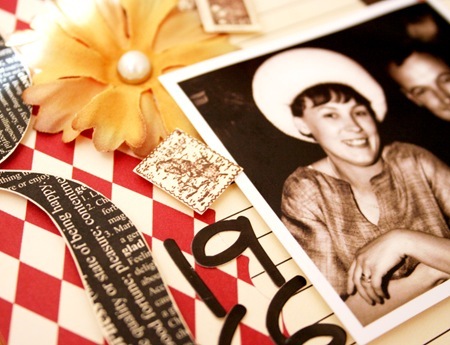 Donna's youngest daughter loves receiving pictures and paintings. 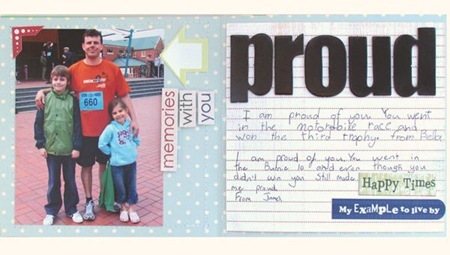 If ever she needs cheering up a simple hand-drawn picture will always do the trick. 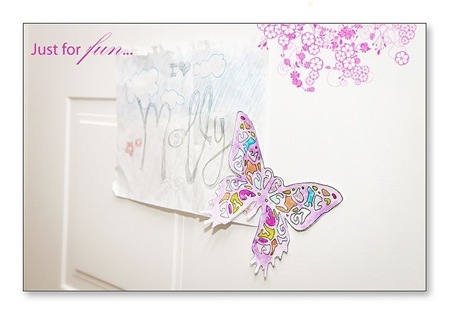 While experimenting with LuminArte Twinkling H2O's Donna created this sweet butterfly and pinned it on her daughter's door as a surprise. It is by no means a dramatic piece of art, but Donna now knows that with a little practice and the right products/tools she could perhaps develop that inner artist...in time! *Notë: to create the outline for the butterfly Donna 'cheated' just a little by using Tattered Angels 'Fancy' Glimmer Screens. Glimmer Screens are a kind of mask/stencil that are perfect for those paint users that are maybe a little in doubt when it comes to their drawing skills. These would work beautifully on a canvas! Carole says that this is something she could get very addicted to. She really enjoyed using these Twinkling H20's in a mini pack of 6 colours, which are rich and vibrant, and as you can see are really pretty in colour. It went really well with the Luxe Colour Me pattern papers. Carole just painted with these and used the Dual Tip marker for Blending, really easy. You could also use the paints as a stamp colour, all you would do is just paint them directly onto your stamps and stamp onto cardstock. A really great idea, and being able to buy them in mini packs of 6 also makes it very affordable. When we started bringing in LuminArte, we thought that to best show off the range and depth and beauty of the products, we could treat ourselves to some guest designers - some of our favourite Australian artists and scrapbookers. Here we thank Kate Mason for contributing an enormous array of beautiful projects and pages, even whilst in the thick of coughs, colds and babies! 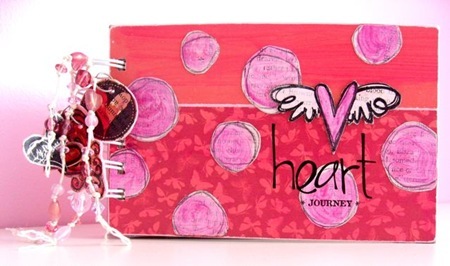 Kate's first project was this amazing mini album she created to document her daughters upcoming heart surgery - and alongside the whole scrapbooking world we send her our prayers and thoughts that Chelsea Blossom will come home safe and sound. 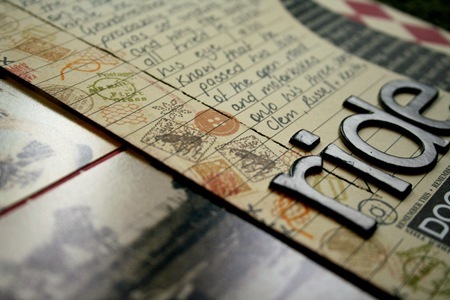 Kate covered the album with patterned paper and decorated with book paper dots. To make the dots, a light coat of white paint was applied, then H2O's mixed with lots of painting medium was also added to achieve the translucent tint over the top. For the charms, Kate stamped with Stazon ink over white painted book paper, then H2O's mixed with painting medium were used to colour the images. Here Kate handcut shapes in various colours of cardstock and then coloured with H2O's, water and painting medium. Depth of colour on the shapes is built up with 2 or 3 H2O colours. She then applied rub-ons applied over the top. How gorgeous is this fairy? Kate painted the background with stone & white crackle paint. She then applied pale H2O tints over the top. For the washed out look she achieved with this layout Kate simply mixed the LuminArte Twinkling H2O's with water. 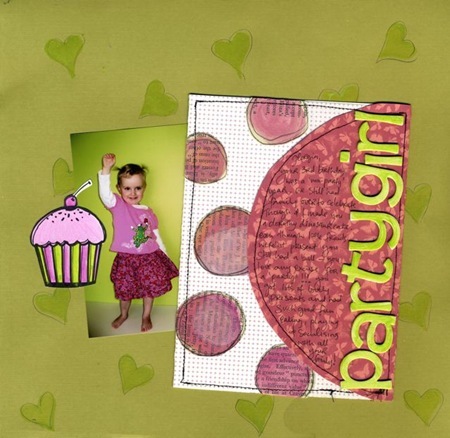 In this gorgeous layout Kate cut out background patchwork pieces and adhered to layout her layout. She then applied rubons and painted over them with the LuminArte Twinkling H2O's. She reported that the H2O's mixed in well with painting medium for a rich creamy but still translucent, coverage, and the rub-ons happily still peeked through! Kate also painted book paper white and then added a coat of the LuminArte H2O's mixed with water for a pale washed out look. The very cute birdie was painted with H2O's mixed with water. Kate reports that the Twinkling H2O's look & feel exactly like watercolour paints but have their beautiful trademark shimmery appearance. Kate further shows the amazing versatility of the H2O's - as well as her talents - as she mixes them here with painting medium and applied directly onto stamps. 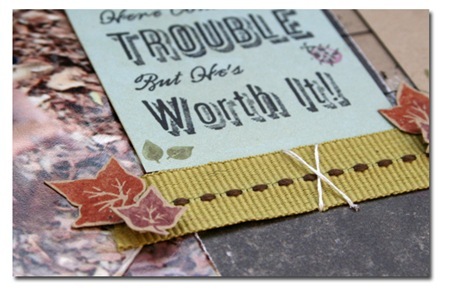 She then stamped all over a similar colour cardstock background paper for a subtle but handcrafted look. Kate handpainted the cupcake with Twinkling H2O's mixed with water - again she used these just as you would watercolours but they have the added benefit of shimmer. Kate then drew large spots on envelope created with gesso painted book paper, and covered with H2O's mixed with water. The gesso gave a nice chalky appearance and the h20's added more shimmer. 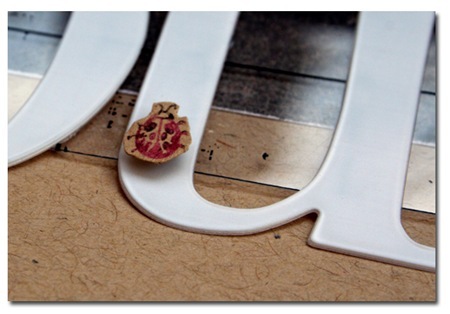 She painted white chipboard letters with H2O's mixed in well with painting medium for a rich creamy coverage. In this final layout Kate painted white chipboard letters painted with H2O's mixed in well with painting medium for a rich creamy coverage. She adhered muslin adhered to cardstock with Mod Podge. While still wet, Kate applied H2O's mixed with painting medium streaked over the top from edge. She added a Technique Tuesday chipboard scroll painted with H2O's mixed with painting medium to the left hand side, and found that 4 or 5 colours built up a delicious rich colour. Thanks again Kate for providing us with so many amazing looks using the LuminArte Twinkling H2O's. The shimmer and twinkle of the product is difficult to portray on a monitor but we hope this inspires you to get your paintbrushes and stamps out and give them a try! This week we celebrate the versatility and fun of Inque Boutique's Morsels. These are the kind of stamp you'd find yourself turning to all the time, as you can build up so many different looks with the same stamps. There's anywhere from 16 to 44 tiny stamps which fit in a box the size of a CD case, and the idea of them is to layer them using different colours and techniques to create a myriad of looks. 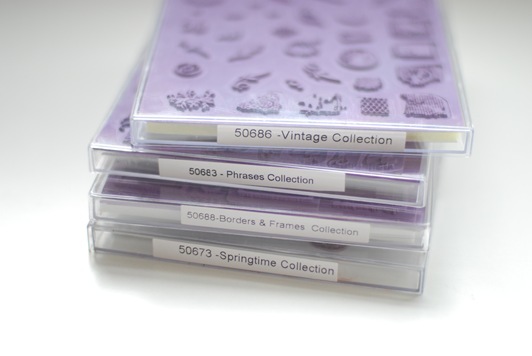 They come in a large range of themes from Seasons to Garden to Vintage, and you can combine a multitude of them to create borders or frames on your layout, or use a few and repeat the image as Carole has done - there really is no end to how you can use them. Enjoy browsing through and seeing what our design team has come up with using them. Carole found the little morsels really beautiful to work with, they are only tiny but make gorgeous craft items and gifts like this window box frame. 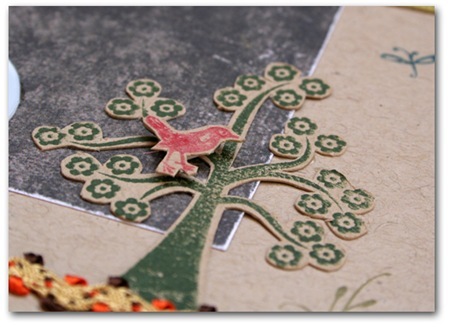 Carole used the little Morsels Autumn range by inking the little stamps (leaves) and stamping a heap of leaves onto cardstock. She then cut them out, and using some foam balls and foam trees for a base and a little double sided tape or glue, she stuck them onto each foam ball or tree individually, starting from the bottom, and ended at the top. It did take a little while but the effect really is quite stunning. 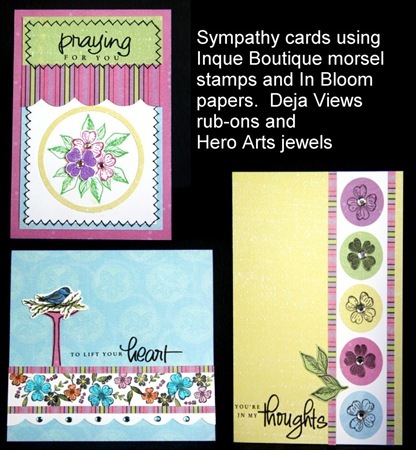 Suz made beautiful use of the Inque Boutique Morsels Springtime Collection in a few different ways. She painted, inked and then stamped on the Scenic Route Berkeley Chipboard Alphas - beautiful chunky alphas such as these are just perfect for carrying small stamped designers. 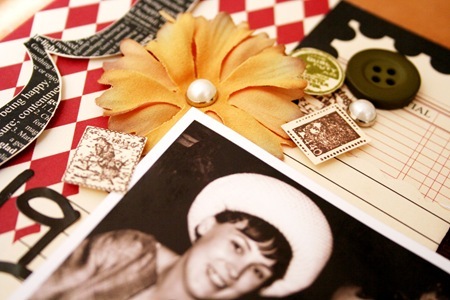 Suz also created a floral border for the corner and side of her photo by laying and clustering the stamps. 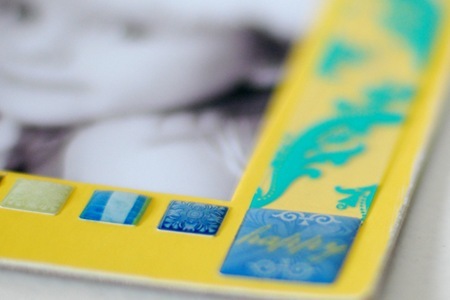 She kept her stamping to a limited colour palette so that it tied in with the rest of the layout, but the beauty of being able to stamp tiny individual images is that you can pick up colours from your photo and repeat and reflect them in your border. 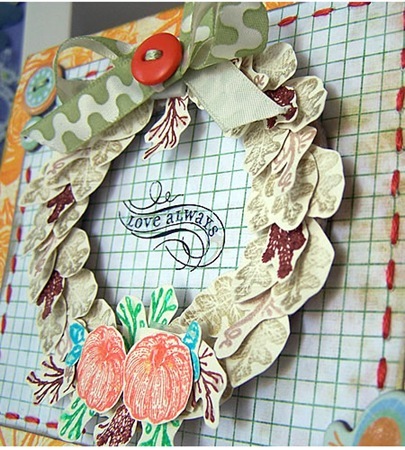 Nicole Finlsyon has used the Morsel stamps from the Garden Elements range to create embellishments. 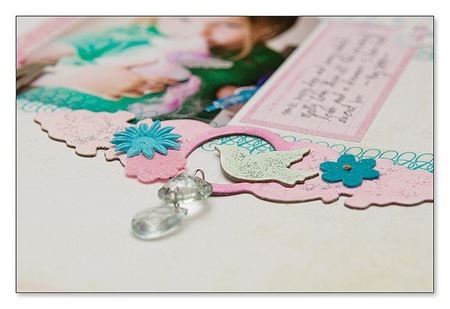 Combined with stamps from Pink Paislee, Nic has brought the theme of garden into her layout with ease. To add her colour, Nicole used Inque Boutique markers from the Vintage collection combined with Stazon Ink. 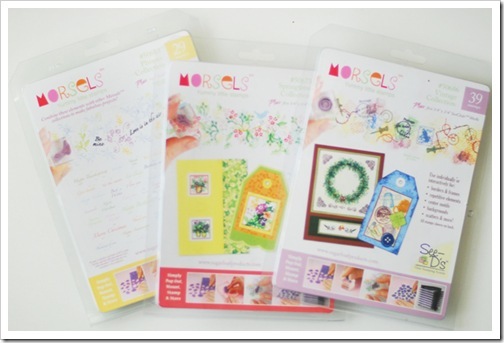 Nicole was really impressed with the tiny acrylic blocks that are included in the Morsels packs as it makes them so easy to use. 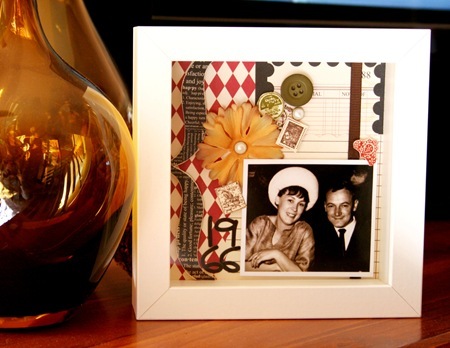 Jaimie purposely chose the Morsel Vintage stamps and combined them with the Theresa Collins Journal it range to make this very cute and sentimental little shadow box frame of her parents in 1966. 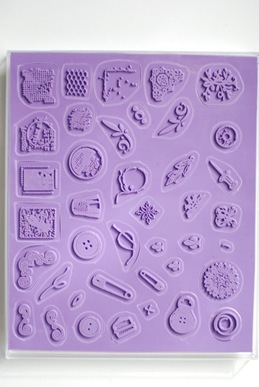 The Morsel stamps were stamped onto the Journal It paper and then cut out, mounted on double sided foam tape and then attached as clusters on the project. Jaimie says that the Vintage morsels are very versatile and can be used in many ways on limitless projects, layouts or cards. Carole made this fun little cards with left over papers, and the Little Morsel Autumn Stamps worked really well for this. She used the Dual-Tip Blendable Markers to get the correct colour scheme for the pumpkin etc., by drawing with the pen carefully onto the stamp, and then stamped onto cardstock. As she does, Carole cut out each individual stamped element, and stuck a small piece of foam tape to the back of each piece, and then added a few embellishments to finish, and a bow. Just something cute and fun, and a great way to experiment. 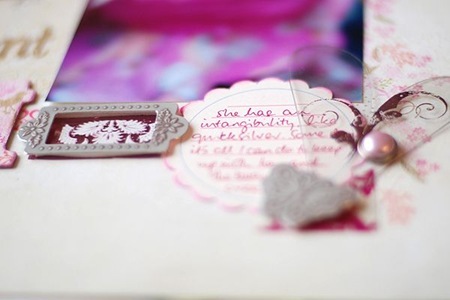 Jaimie used the vintage range of Inique Morsel stamps for her LO - these tiny stamps were the perfect size to create a subtle border on her page with out overwhelming her LO. 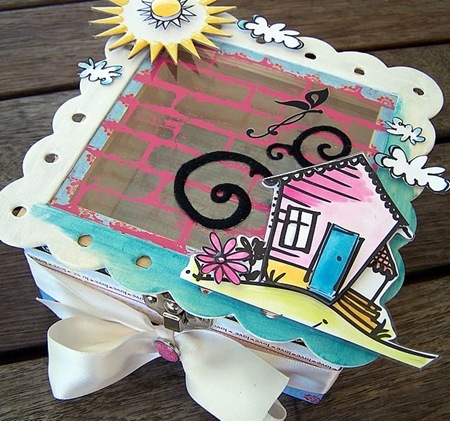 Jaimie used Tim Holtz inks to stamp the images in various colours onto her page. Chris stamped the Spring Morsel flower stamps using black Stazon ink onto different coloured pieces of the 'In Bloom' papers. Chris then used a circle punch to punch out each of the flowers. 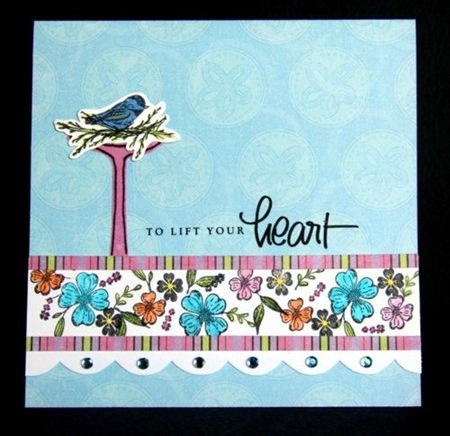 Chris used black Stazon ink to stamp many of the Spring morsel stamps onto a piece of white cardstock. She then coloured them in using the Inque Boutique blendable markers. Chris used the same techinque for creating the bird in the nest, but this time cut around the image and then placed it onto her card. Chris created the nest by stamping the same foliage stamp multiple times. Chris stamped the morsel leaf stamp in a circle onto white cardstock, she then stamped 2 different morsel flower stamps onto a seperate piece of white cardstock and cut them out. She then adhered them to overlap the leaves. Chris used Raspberry, Violet and Fresh green versa color ink pads. 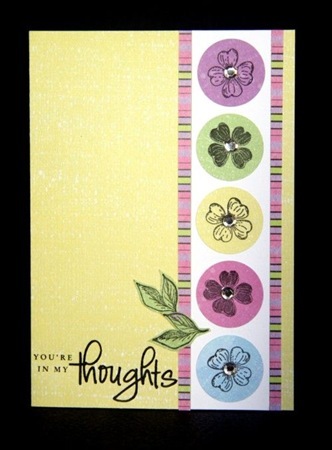 Chris has used Inque Boutique 'In Bloom' papers to create all of her cards. 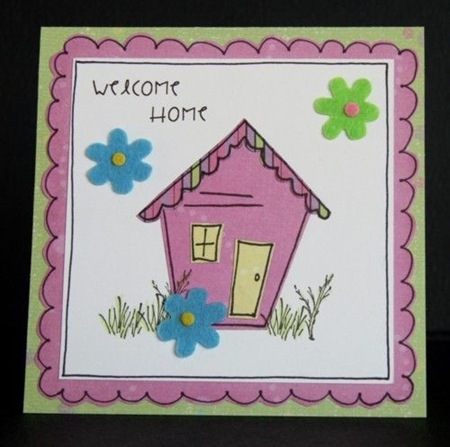 She paper pieced this very simple house design and used the Spring morsel stamps to create some grass and bushes around the house. She stamped the images using black Stazon ink and then coloured the images with Inque Boutique blender markers. Finlly - Chris created this little sample card of some of the techniques that can be used with the morsel stamps - using Inque Markers, blenders, Stazon Ink, VersaColor ink and water coloured pencils. Click to see larger. 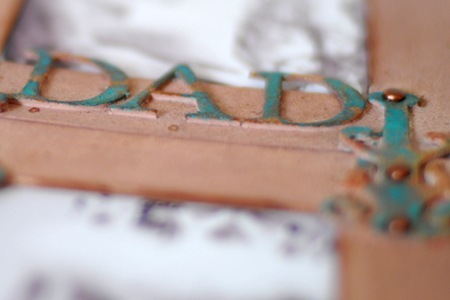 This week we're sharing early ideas for father's day, to get you organised and to highlight product you'll hopefully find in stores to make making a present this year quick and simple. 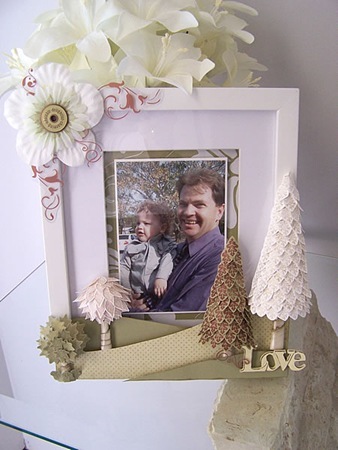 If you need to create a quick gift, there's nothing that can make your life easier than one of the Heidi Swapp Frame Kits. 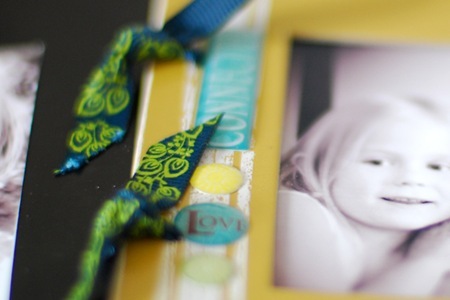 Suz adapted the Sports kit to make the above self-standing cluster of frames though she swiped the yellow one from the Summer kit which would look gorgeous on any dad's desk at work or bedside table. 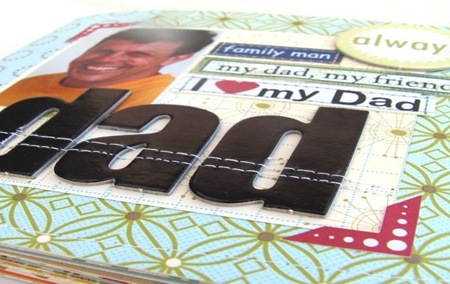 Many of the embellishments supplied are versatile enough to be used anywhere, including the rubon borders and stars, the index tabs and the #1 which worked perfectly with the additional DAD rubon. 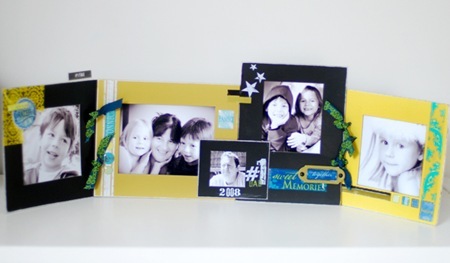 To bring the look right up to date, Suz simply added some Little Yellow Bicycle Vita Bella Epoxy words and co-ordinating ribbon to join the frames, and a touch of Hambly transparencies. And then she played with the frames from the Summer kit to make this gorgeous wall hanging, though there wasn't much of the gorgeous aqua and yellow summer colours left by the time Suz finished with it. This time she added Grungeboard into the mix with flourishes and alphas from a pack of Elements, and even used some larger scale Grungeboard hinges to join the two frames together. Before adding photos Suz adhered all the grungeboard to the frames and then covered the lot in white gesso. While it was still wet she sprayed and blended Suede Glimmer Mist over everything and allowed to dry. Finally she used the Luminarte Radiant Rain Daubers in Copper and Patina and Solar Gold to highlight bits of the Grungeboard. The control you have with the Daubers to only tint the raised elements makes this really easy. 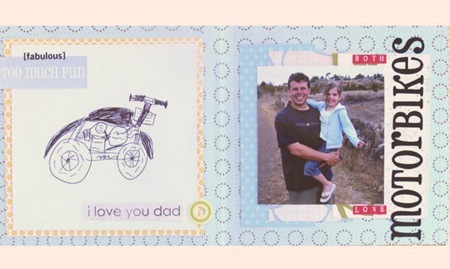 For this challenge Mel decided to scrapbook a mini album with her two children, as a gift to keep ready for Father's Day this year. To create the album a variety of Scenic Route papers were used and cut into 6" X 12" rectangles, folded in half and then adhered gently in the middle before being machine stitched together to form the album. The side was then bound with another piece of Scenic Route paper to complete the main structure of the album. 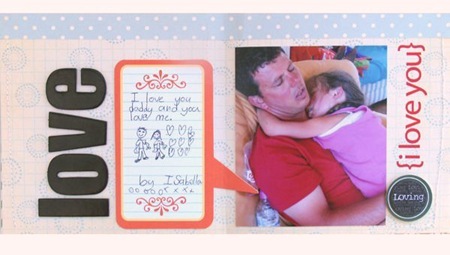 Mel's two children hand recorded the journaling and drew pictures in the album to add a nice finishing touch that's sure to please any Dad. 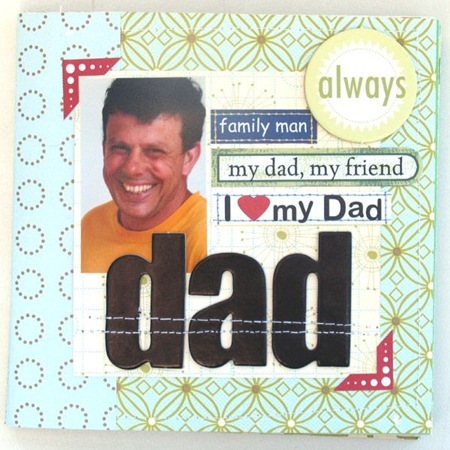 Carolee's Creations have brought out some really lovely embellishments, papers and stickers (including Father Expressions Foam Stickers) that are suitable for your Father's Day projects. Mel has included many of these throughout her album. 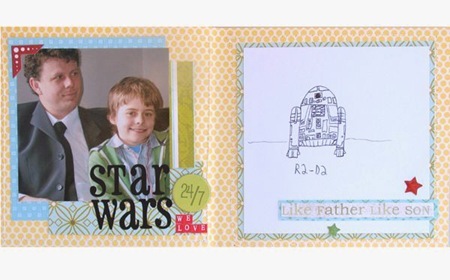 We all know boys never grow up, so really, there's no reason those funky robots and cute dinosaurs that appear on our son's pages won't work just as perfectly on presents for their dads! 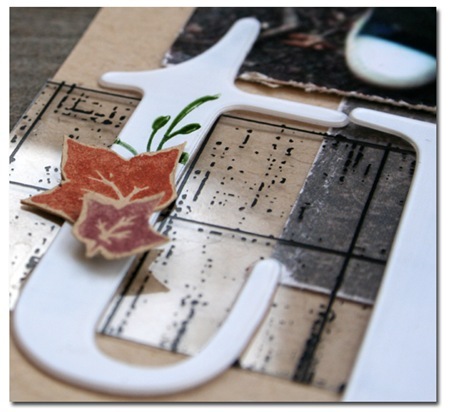 Check out these gorgeous gift ideas using Inque Boutique out of this world and BasicGrey Archaic. 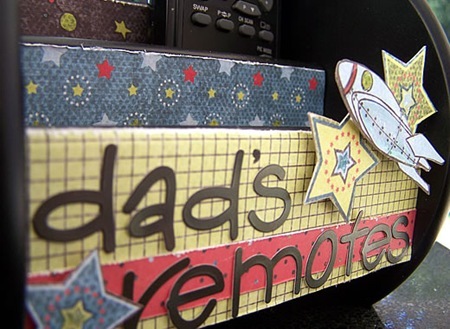 It can be hard sometimes to think of fab father's days gifts. 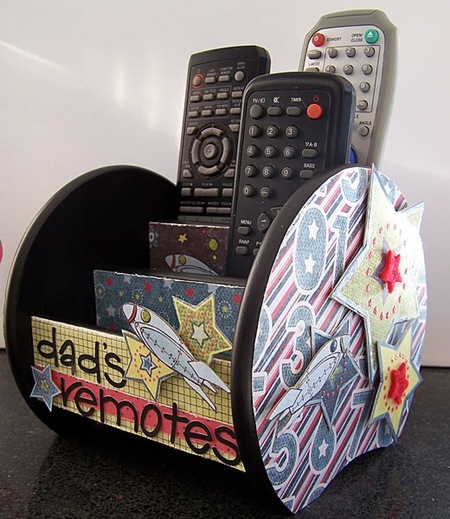 Carole decided on a Remote Control Holder - lets just say in Carole's home the remote is always next to one person! Sarah loved the idea, and thought it would be a great gift. To create this gift Carole used the bright and funky colours in the Inque Boutique Out of This World range - what fun they were. To keep it simple Carole covered only the flat sides of the remote control holder, keeping the original black edges and sides as a highlight. 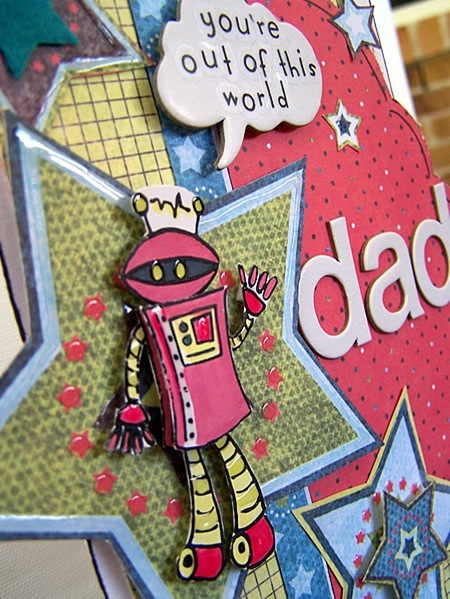 She cut out and layered stars and robots and the black Pink Paislee alpha stickers were perfect for labelling. 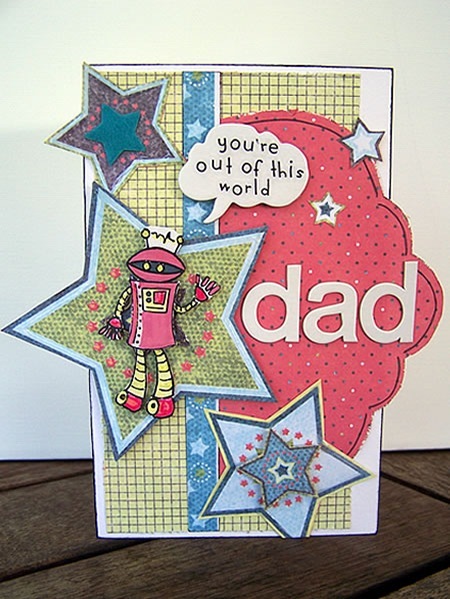 Carole also used the co-ordinating Inque Boutique stamp set with the really cute robot for a matching card. 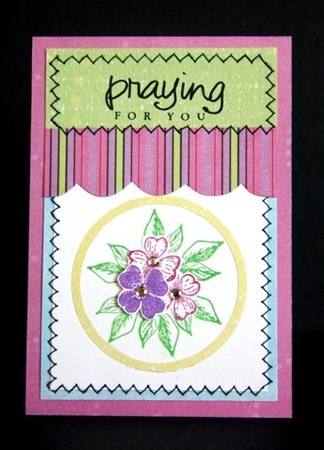 She stamped this out twice onto white cardstock and then coloured in with the Dual Tip Blendable Markers. She layered parts of the little robot with foam mounting tape and did the same with the stars, and used cute little felt stars from the same range to finish it off. Now she's pleased she's finished nice and early for father's day!! Caz found this wooden wine bottle box at one of the local junk shops. She loved the dark wood, the metal catch and the rope handle (not to mention that it only cost $4.95) but the print on the front was a bit blah. 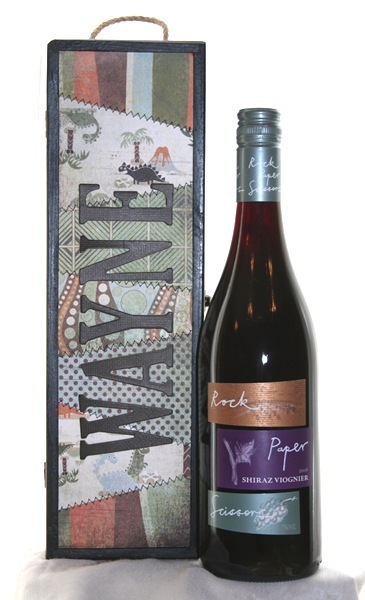 So she did this... A patchwork of BasicGrey Archaic papers and some Chip Chatter letters quickly transformed it into a stylish, personalized holder for a bottle of her hubby's favourite red. 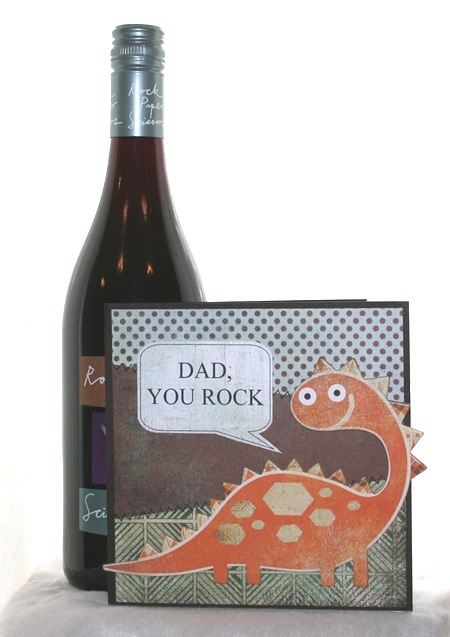 A patchwork card made from matching papers and one of the BasicGrey Chipboard dinosaurs. Too easy!